Marine refrigeration and HVAC specialist Dometic has upgraded its range of CoolFreeze CFX compressor cool boxes with what it describes as being the largest in the series. The CFX 100W, which made its debut at the London Boat Show, UK in January this year, features a capacity of 87litres and is suitable for deep-freezing at temperatures descending to -22°C. Users can also control the unit via a WiFi app. As such, a boatowner can use his/her smartphone or tablet, whilst on shore, to check that the cool box is still functioning at the correct, designated temperature – thus preventing food or drink from going off, or an onboard party being marred as guests return to a box full of melted slush. The box also features a digital temperature control display. The CFX 100W can be operated on either 12volts or 24volts DC, or on any AC voltage between 100-240volts. An automatic reverse-battery protection circuit, integrated low-voltage protection and an electronic safety device have also been incorporated into the box, for end user safety. 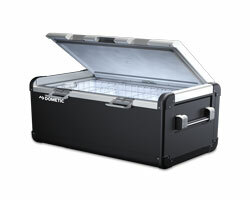 In terms of energy savings, Dometic estimates that the CFX 100W also consumes less energy than comparable coolers.